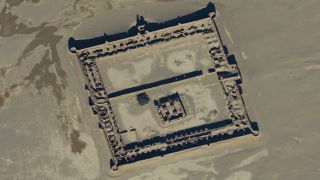 The lost caravanserais of the Silk Road in Afghanistan have recently been uncovered using satellite imagery. Here, a satellite image of a 17th century carvanserai, or waystation. Spy satellite imagery is revealing lost Silk Road outposts and the traces of vanished empires in the forbidding desert regions of Afghanistan, new research reveals. The new archaeological insights come from decades of imagery collected by commercial and spy satellites and drones, Science reported. Among the finds: huge caravanserai, or outposts used by Silk Road travelers for millennia, and subterranean canals that were buried by the desert sands. The archaeological sites are too dangerous to explore in person, so the new mapping effort, which is funded by a $2 million grant from the U.S. State Department, enables researchers to study Afghanistan's archaeological heritage safely, experts said in November at a meeting of the American Schools of Oriental Research in Washington, D.C.
"I'd expect tens of thousands of archaeological sites to be discovered. Only when these sites are recorded can they be studied and protected," David Thomas, an archaeologist at La Trobe University in Melbourne, Australia, who has done remote sensing work in Afghanistan but is not a member of the mapping team, told Science. The Silk Road was a massive network of routes spanning the globe from Japan and Korea in the East to the Mediterranean Sea in the West. For centuries, luxuries such as tea, precious gems, perfume, spices and of course, silk, from the East made their way west along these land-based routes, according to UNESCO. At the midpoint of Central Asia, the geographic region that is now Afghanistan sat at the crossroads of these ancient trade routes, and thus profited from all the trade that flowed through the region. When the Silk routes were flourishing, empires in the region amassed great wealth, according to the United Nations Assistance Missions in Afghanistan (UNAMA). The conventional wisdom was that once sea routes opened between India and China and the West in the 15th and 16th centuries, these caravan routes, and the once-wealthy empires that benefited from them, declined, according to UNAMA. However, the new spy satellite imagery reveals that these trade routes were still thriving a few centuries later. The effort is also uncovering lost history from other periods of time. Images collected in the 1970s are being reexamined to reveal hidden canals that thread through the Helmand and Sistan provinces of the country, Science reported. These canals were likely built during the Parthian Empire and helped agriculture to flourish. The imagery has also revealed the melting pot of religions that once thrived in the area, from Zoroastrian fire temples to Buddhist stupas.